There are few regions in the world where you can make true “ice wine,” a sweet, dessert-style vintage. 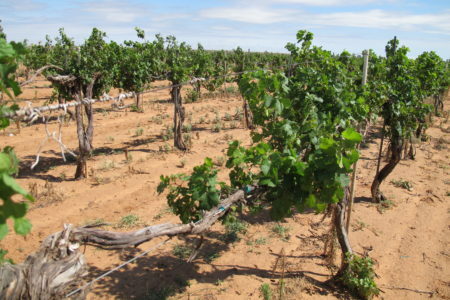 You need warm summers to grow quality grapes. But the fruit must be picked and pressed when it’s well below freezing. So you need frigid winters. Most of the ice wine in the U.S. is imported from Canada or Germany. 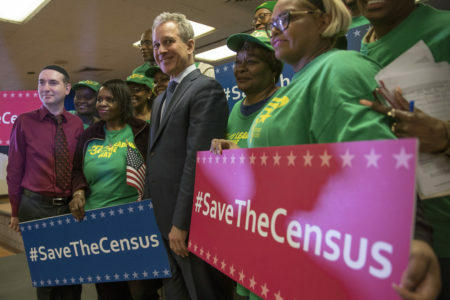 But a growing number of wineries in places like upstate New York, Michigan and Pennsylvania have started making their own, giving American consumers the option of buying domestically produced bottles. The frozen grapes are collected, then pressed outside while they’re still frozen. It’s risky waiting so long to harvest — a wind storm can destroy the whole crop. But the reward is 375 ml bottles that fetch $50 and up. 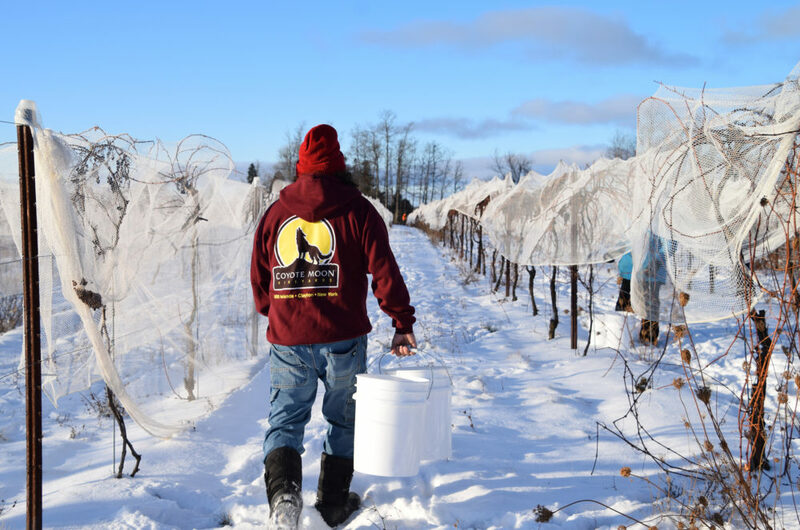 Coyote Moon vineyards, a family-owned winery in Clayton, N.Y., just a few miles from the Canadian border, began making ice wine last year. As an arctic front settled on the vineyards recently, creating the perfect harvesting conditions, workers harvested the grapes for next year’s vintage. It was 3 degrees Fahrenheit when the winery’s crew trudged out to 30 rows of vines dedicated to ice wine. It was so cold that the snow was squeaking underfoot. The temperature dropped to zero just as the sun peeked over the horizon. The vines were cast in orange. And the snow glowed blue. Robert Heyman, a Coyote Moon employee, returns to the vines to fill his bucket with frozen grapes. The vineyard grows two cold climate varietals for ice wine: frontenac (red) and frontenac gris (white). The vineyard has grown two kinds of grapes for ice wine this year, both cold climate varietals: frontenac (red) and frontenac gris (white). This is only their second winter making the product for mass distribution. It’s the first for frontenac gris, so there’s still some experimenting involved. 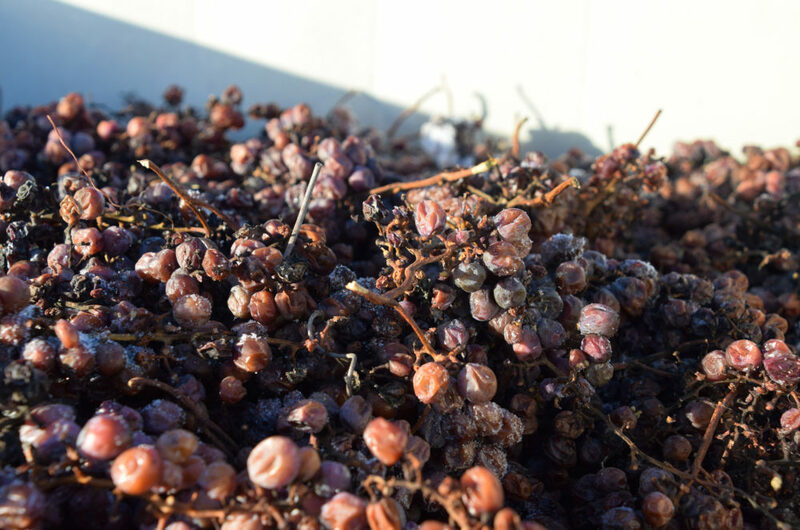 “We’re letting these grapes essentially turn into raisins,” says co-owner Tony Randazzo. Ice wine is believed to have started in Germany in the 1700s, when winemakers had to make the best of a frozen harvest. But Canada has become the world’s leader today. In the United States, ice wine is made throughout upstate New York, as well as parts of Michigan. Coyote Moon follows Canada’s strict standards. Winemakers have to harvest and press the grapes below 17.6 degrees Fahrenheit, and there are precise guidelines for alcohol and sugar content. “It’s got to be called ‘ice wine,’ ” he says. There are big risks to leaving tons of grapes just hanging on the vine long after the traditional late summer harvest. A windstorm can blow away the whole crop. 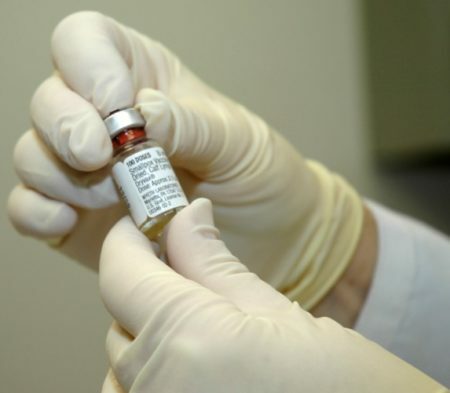 Adequate cold may not come for months. Last year’s warm winter delayed the harvest until February. But on this day, there will be no tasting. Ice wine requires patience. After pressing, the juice will ferment and age for a year, just about when it’s time to brave the cold and harvest next year’s frozen crop. The bottles with last year’s frontenac harvest are just about to come in from the manufacturer, meaning Coyote Moon’s ice wine will soon be ready for sweet sipping.